From a young age Leon was interested in learning new things; in his spare time he could have been found outside looking for interesting rocks, or reading books on herpetology or marine biology. As he got older his thirst for knowledge never ceased; finding solace in experimenting with circuit boards and Smithsonian crystal growing kits his knowledge base grew and became more refined. 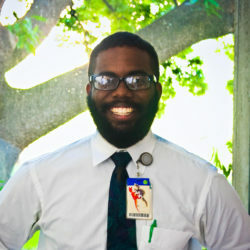 Now, while working at the Houston Museum of Natural Science, he is studying chemistry at the University of Houston.